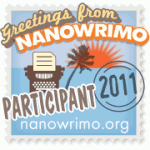 I have just signed up for NaNoWriMo — National Novel Writing Month. My goal is to write a complete 50,000 word novel in a month. To make my goal I will have to write 1666 words per day. I am going to target 2000 words per day. I would rather write too many than too few, and this way if there is a power outage or some other technical crisis, I will have some wiggle room. If you are participating in NaNoWriMo and would like to follow my progress, I am writing as Quilldancer. If you aren’t participating in NaNoWriMo and would like to follow my progress, just visit this website. I will update my word count daily. That’s a great goal. Have you been thinking of your story line for a while, or are you going in with more of a “Create as I go” approach? Jeff, I am currently working on a detailed outline. Definitely edit the novel you already have! Where’s the new job? What’s the new job? Been there and commented. Loved it! For some reason I am not being notified of comments here. I must figure out why. Good luck! I wish that I had the nerve to try it! on 2011/10/27 at 6:50 am Barbara H.
I’ve heard about this for years and thought about it. November is such a busy month with the holidays, though. I wish you well! 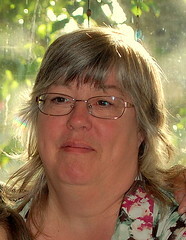 Barbara H. on All Signed Up!